Paul has participated in projects including turnaround and sale of small port and shipping companies, analysis and site development of LNG terminals in U.S. seaports, business planning, financing and startup of short sea shipping ventures from South Atlantic and U.S. Gulf ports and the conversion of underperforming port facilities throughout the Eastern seaboard. Paul is also the U.S. East Coast Regional Director for Maritime Trust Company. He has over 35 years distinguished executive experience in maritime business, both public and private. He has significant experience in intermodal development and operations, joint venturing, international trade initiatives, and port partnering, as well as marketing and sales activities. Paul was Port Director at the port of Port Everglades where he directed the building and operation of Florida’s first Foreign Trade Zone, sought and secured federal funding to deepen and widen the channel and harbor, and diversified the user mix with the port’s first cruise terminals and South Florida’s first modern containerized cargo terminal. 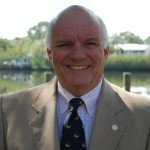 In the 1980s he served as Managing Director and CEO of the Jacksonville Port Authority, overseeing two major seaport terminals, an international airport and two general aviation facilities. In the 1990’s, he served as President/CEO of the Ports of Philadelphia & Camden. There, he oversaw unification of all maritime and rail facilities under public ownership as well as marketing and trade development for all marine interest in the region, comprising $500 million in assets and 31 separate terminals and facilities. In addition to his role in the public port arena, Paul’s career includes Director of Ports and Intermodal Business Development in the Transportation Business Group, CH2M Hill Engineers, and President & CEO of Standard Gypsum Corporation, Bulk Stevedores and Great Southern Derrick Barge Corp.
Paul has served as President of the Florida Ports Council, as well as serving on several AAPA Committees. He received the Freedom Award of the U.S. Navy League and many years participation in the American Tall Ships Association. Paul is a native of Boston, holds a degree in Comparative Government from the University of Massachusetts and attended Suffolk University School of Law.